Period Gustavian aesthetics and craftsmanship at their very best! 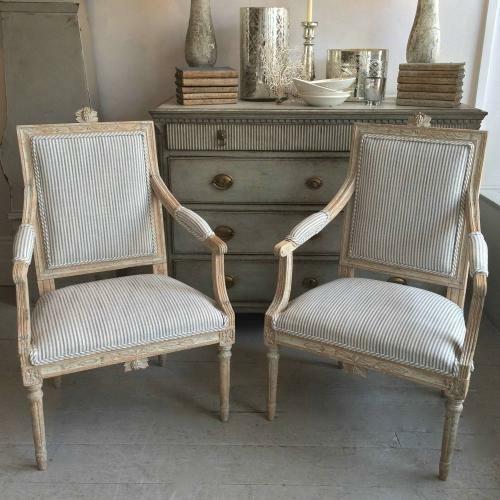 A pair of exquisitely carved and decorated 'High Gustavian' armchairs from Stockholm in their original 18th century paint with wonderful time worn patina, newly upholstered in a beautiful dove grey Designers Guild ticking. Circa 1775 - 1790. The pair would look amazing as side chairs in a hallway or dining room, or could take centre stage in a drawing room or bedroom.